Here are two events that can bring you win-win investment opportunities. The first is taking place in China. China has the largest and one of the fastest growing economies in the world. However, due to a natural slowdown in this growth, investors have panicked. The Chinese Stock Market and China’s currency have collapsed. Yet China’s global economic influence grows. For example, the $5.4 billion Panama Canal expansion opened this week. The first vessel through was not American or European. 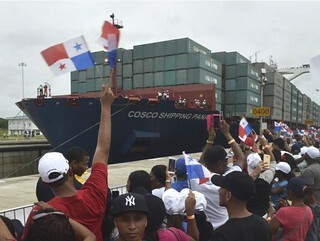 The Chinese merchant ship, Cosco Shipping Panama, led the way. This photo from a USA Today article shows it crossing the new Cocoli Locks at the Panama Canal on June 26, 2016. (1). 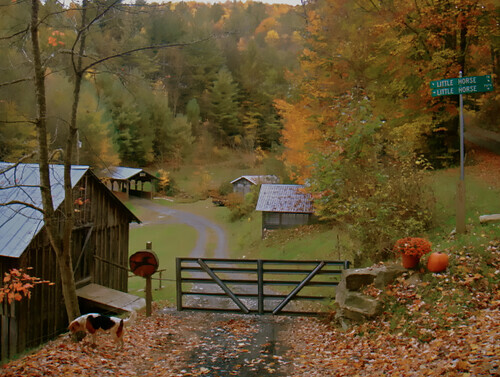 The second opportunity is in the UK as the British pound has fallen into the low 1.3 dollars per pound range. I have seen the pound as low as 1 pound per dollar ($1.05 officially and I made a big forex profit then). 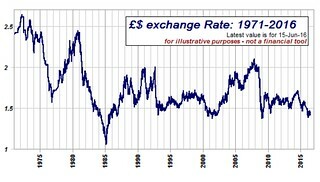 You can see that pound crash in the 1980s in the chart below (3). The same potential exists now. Here is why both of these forex positions are win-win situations. Each currency has the potential for a quick rebound (and profit). Yet if the currency remains weak for some time, both the UK and Chinese Stock Markets are good value markets. If you invest in British and Chinese shares, your odds of long term profit are maximized, plus you have the extra short term potential for forex profit. Here is what I do. My basic strategy is to diversify into an equally weighted portfolio of good value markets as defined by Keppler Asset Management. Statistically, this is the best way to easily outperform global equity markets. I emphasize the word easily. A key feature of this strategy is that I don’t have to spend much time trading based on short term volatility. I have too many other things I enjoy doing more. Currently there are 20 good value markets, 10 good value developed markets and 10 good value emerging markets. I invested 70% in the good value markets and 30% in the emerging markets using Country ETFs. Each of the ETFs invest in the MSCI (Morgan Stanley Capital) Index of one of the markets. From this base, from time to time, I speculate by emphasizing one market or another. For example, due to the special Chinese opportunity, I treat China as a developed market instead of an emerging market. Thus it gets almost 7% of my portfolio instead of 3%. The UK is a good value developed market and one way to speculate on this special position is to overweight the UK position (about 7% of the total portfolio) by perhaps doubling the weighting with a pound margin loan. Most investors maximize their returns by investing into a broadly based good value portfolio. When we have such a base of investments, we can cautiously expand our positions during special circumstances (such as in the UK and China) to add spice to a logical long term position.